Sorry, my last post bordered on belligerent. I’m just wondering what exactly you are using for your uvb source. 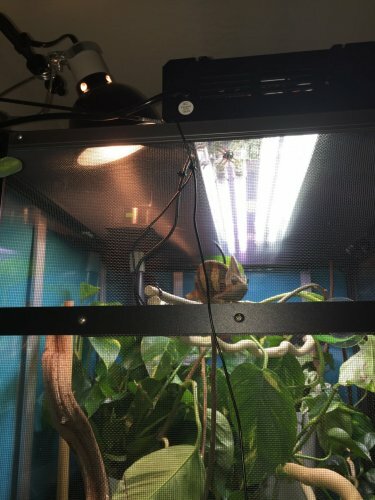 Your setup looks great, and I’m sure your Cham is well taken care of. I was just curious about whether you had all the correct specs for your lights. 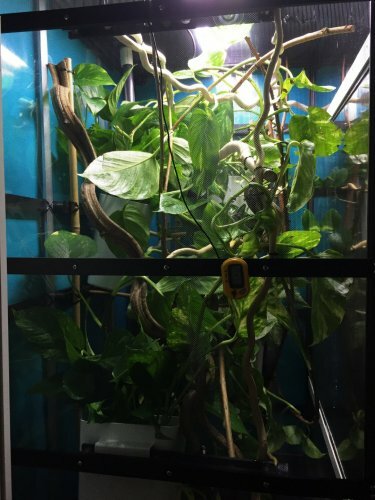 If you want true bioactive, you won’t get it without heavily modifying the bottom of your enclosure. What you have is a great idea, just won’t work for bioactivity. You could simply pull out the hydroballs and replace with organic soil. 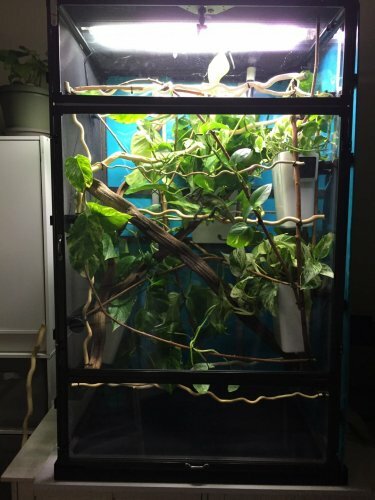 If you want true bioactivity, imagine making the entire base of your enclosure a planter. You’d have to have at least 6-8 inches of waterproof base material to fill. It is a grow light. Just the bulb, i believe i can change bulb to whatever, Have a Lumens tester but not a UVB. what ara good brands? Totally agree on branches, plan on doing more asap. more real plants too eh? you think? You'll need a drainage layer like the hydro balls you have. You could use lava rock or similar. The point is to keep the weight down. Next, you will want a layer of organic soil. Next you can opt for something like the Exo Terra Plantation Soil. It's light and will allow the soil beneath to breath. Last, you'll need leaves or moss. I personally like moss. Seems to work well. Last, you need to seed with isopods and springtails. If you can go to a show or find someone online, you can get a nice mix of various types of isopods. Edit to one more point. 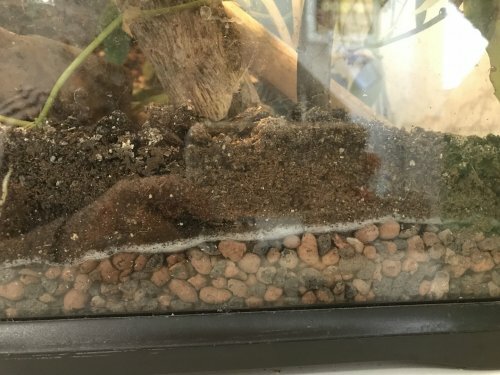 I purchased replacement window screen and created a second layer to help retain the soil but also provide air circulation. Worked like a charm. Sorry I didn’t respond last nite. I don’t know what bulb will work for your ballast. My guess is your ballast will run 200-400 watt, so I guess I’d do a search for 200 watt uvb bulb. A 4 bulb t5 setup will be awesome. If it were me, I’d use 2 uv bulbs...maybe a 6% and a 12%, and two 6400k plant bulbs. I know Mh push a lot of light, but the only ones i know of that can produce usable uv are the hqi double ended bulbs. Yeah, but hindsight is always 20/20. Just chop your MH and bank the $. Then, when one of the hqi come up for a reasonable price, grab it. Sounds like your Cham is going to be spoiled rotten. I was ignorant on what I thought was bioactive. What you guys are doing is amazing. I am considering raising the bottom. Been doing alot more reading on it, gonna be a bit of a project. Really like the idea of never cleaning poop again lol. Hi there. Just wanted to chime in here. 2 uvb bulbs at that level will be far too much for a Panther. At most Panthers are recommended to have a 10.0 or 12% and only when there is dense foliage. To the OP @JIFFYPOP I have a quad unit for my Veiled I run a 12% arcadia, 1 plant pro bulb, and two 6500 daylight bulbs. Depending on your highest basking level a 12% may be fine but please do not run two uvb bulbs. It will provide too much UVB for a Panther. Panther's at most would need a 3 UVI range but they have to have the ability to get down away from the UVB. The UVI level of the UVB will decrease as you move away from the screen that the fixture is sitting on. You want the fixture to run the length of the cage. Here are my levels however they will vary from yours due to not having the exact same bulbs, fixture, and cage that I do. The inches refers to the actual level measured away from the top screen beneath the light. So if your highest basking branch is 7 inches below your screen and your cham's back rises 2 inches above it this is putting him into a 5 inch range. Which would mean the level of UVB the cham is getting exposed to is roughly a 3 UVI. Here is an image of my lighting and how it runs across the enclosure. This is what people mean by densely planted and lots of horizontal branches. Front view and side view.